For two years, Tasneem Raja has been putting in the hard work of creating a new local news organization from scratch. Raja, along with her husband, co-founded The Tyler Loop, a digital news site covering the east Texas city in 2017. The work isn’t glamorous. Without much financial support, Raja has been producing stories, establishing relationships in the community, and figuring out a revenue model for the site. “Before I started monetizing, before I asked anyone for any money—or even their time as an advisor or a board member etc.—I just started producing the work I intended to produce. On the side, nights and weekends, just to see,” Raja tweeted recently in a thread in response to the recent hubbub over The Correspondent’s decision to not open a US-based newsroom. The two threads she wrote on the topic are worth reading in full, and they inspired me to reach out to her to learn more about how she’s thought about slowly growing the Loop. So, I want to say something about a theme I'm seeing in public responses to the @The_Corres's botched, confusing, and at times disrespectful messaging about whether or not they would have the sort of U.S. footprint many members and non-members were expecting. I featured Raja and the Loop in the very first issue of Solution Set last year. I covered the Loop’s awesome Taco Tour, but in this week’s Solution Set we’re going to look more closely at the Loop’s overall business, its approach to better serving its community, and how it’s working toward sustainability. Solution Set is a weekly report from The Lenfest Institute for Journalism. Every Thursday, we take an in-depth look at one extraordinary thing in journalism, share lessons, and point you toward other useful resources. You can also sign up for an SMS text message version of Solution Set, that I created in partnership with GroundSource by clicking here or by texting SOLUTION to (215) 544–3524. Earlier this week, I texted the community there asking what they wanted to learn from Raja about the Loop. Their insightful questions and comments inspired the questions I asked in our interview. • The Challenge: The Tyler Loop started as a “small-batch digital magazine” that was effectively a side project. • The Strategy: The Loop has changed its focus to audience-first engaged journalism and developed a three-pronged business model that centers around membership, events, and sponsorships. • The Numbers: The Loop now has about 120 members and needs to reach 400 members to be sustainable. • The Lessons: Loop executive editor Tasneem Raja has focused heavily on building relationships within the Tyler community, which has changed the site’s approach to journalism and has also been essential for creating its membership program. • The Future: The Loop plans to continue its events program and re-introduce greatest hits like its well-regarded Taco Tour. • Want to know more? : Scroll down for more on how local news organizations can reach new audiences and attract new funders. Wife-and-husband duo Tasneem Raja and Christopher Groskopf co-founded The Tyler Loop in 2017. Tyler is a city of about 125,000 people in East Texas. They both have national news backgrounds — Raja worked at Mother Jones and NPR’s Code Switch, Groskopf was formerly Quartz’s data editor — and decided to focus their journalistic efforts on their adopted hometown by creating a new digital news site. It started, in effect, as a side project, as Raja was primarily freelancing for national outlets and Groskopf was working his own full-time jobs. From the outset, the site published a number of longer features on topics such as first-person narratives from undocumented residents living in Tyler and a history of the city’s once-segregated schools, which included the story behind its current high school, Robert E. Lee High School. But as the Loop continued to attract interest in the city, Raja began to focus more of her time and effort on developing the Loop. She now serves as its executive editor. They also realized that the project wouldn’t continue to work necessarily as a site that produces only longform journalism. So last year, the Loop began plotting out a path for its future by developing a membership program and rethinking its approach to coverage. Raja’s view of journalism has changed as she has gotten to know the Tyler community through her work with the Loop. That view of journalism — centered around helping people fill information gaps and improve their quality of life — has, as a result, influenced the type of reporting Raja is producing the Loop and also how it’s thinking about building out a revenue model. Much of the Loop’s reporting now begins from a database of story ideas that Raja has been compiling over the past several months by asking readers what they want to learn more about. But one of the themes that emerged from the survey was that there were a lot of questions centered on affordable housing. So Raja began working to report out some of the major questions that people had, and also asked others to submit questions — including in a call out on the Loop’s homepage. The affordable housing coverage will include multiple components, including an FAQ that answers basic questions about the issue: What is affordable housing? Where is the affordable housing in Tyler? How do you get it? In addition to turning to its readers for story ideas, the Loop also wants to involve them more through events and in-person gatherings. In-person connections have been a focus for the Loop since its earliest days with its Taco Tour, but it’s now re-thinking what it means for a news organization to connect with its community IRL through a range of different types of gatherings. Tomorrow night, the Loop is holding its first community storytelling event. It invited 10 residents to share personal stories about what it means to live in Tyler and the challenges and opportunities facing the region. It sold out a 300-seat theater in downtown Tyler for the event. “The buzz about this around town has been really robust,” Raja said. She’s now thinking about other ways to incorporate in-person get-togethers. For example, as part of the reporting on affordable housing, could the Loop hold a moderated conversation where Raja could interview some of her sources on stage and invite the community to partake in the actual reporting process? That’s one of the models the Loop is considering as events have become a more concentrated focus for the site in the past year. Beyond just the reporting, events are also becoming a core part of the Loop’s emerging business model. The Loop is a non-profit; it’s in the process of finalizing its 501c3 status with the IRS — this can be a complicated process for news organizations, and the recent U.S. government shutdown delayed things for the Loop. It spent some time deciding whether or not it made sense to incorporate as a for-profit or non-profit entity, and The Loop ultimately decided to go the non-profit route because it felt like it gave it some additional opportunities to generate revenue. • Membership: The Loop launched its membership program last summer. The site decided to pursue a membership model so it could ask for support from the readers who most value the Loop’s work while keeping it free to access for everyone. So far, members have gotten free access to some Loop events, and Raja said she is planning to build out other aspects of the membership program as it grows. • Events: Beyond their editorial value, Raja sees events as a revenue generation opportunity. • Underwriting: The Loop would also like to establish a portfolio of local businesses and organizations that sponsor both its reporting and its events. The Loop debuted its membership program last July, and it now has 120 paying members. The base level of support is $15 per month. The Loop’s first 100 donors were easy to attract through its email newsletter and call outs on Facebook, but it’s had challenges growing beyond those initial supporters who were the site’s biggest fans. Raja projected that the Loop needs to reach 400 members to sustain itself, but Raja said she’s looking for additional support to be able to grow its outreach. Raja wouldn’t share specific revenue figures or goals, but the Loop still describes itself as a “pro bono pilot project” on its website. Raja said she’s still freelancing to help cover costs, though she’s had to do less and less of it, and has been able to focus more fully on running the Loop. But one of the reasons she said she’s been able to afford to work on the Loop while not having a full-time income is because the cost of living is not as crazy as it is in many coastal cities. 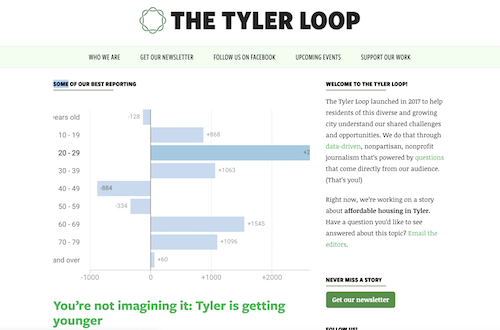 • Build relationships: As the Loop has turned toward its audience-focused journalism, Raja has had to focus on building relationships throughout Tyler to build trust and also to ensure that the coverage is actually reflective of the community. With the coverage survey, for example, Raja had initially promoted it on the Loop’s website and across its digital platforms. But she quickly realized that she wasn’t reaching a large swath of Tyler residents through that approach. Raja connected with the CEO of a local nonprofit group that runs a program called Getting Ahead, which tries to help individuals experiencing poverty by teaching them new skills and equipping them with resources and guidance in areas such as housing, transportation, employment, education, and more. She was invited to come speak with the group, and she printed out copies of the surveys to ask them what information they would like to receive from the Loop. This type of relationship-focused community building does not happen overnight. It takes time to make those connections and to effectively establish trust and understanding. But Raja has committed to establishing these networks and investing the time because she sees it as a core aspect of the Loop’s journalism. She’s also participating in a program called Leadership Tyler, a local leadership development program. Raja was initially hesitant about whether she wanted to even apply to the program because many of the other participants are people who she’ll be covering at the Loop. • Educating Funders: While there is robust culture of philanthropy in Tyler, the idea of foundations and individuals supporting journalism is still fairly novel in the city. Raja highlighted how the Loop — along with other local news startups such as The Devil Strip in Akron, Ohio — exist outside of areas where much of the funding for innovative journalism projects is happening. So much like how she has had to work with sources to build trust for coverage, Raja has had to do the same when it comes to potential funders also. She said it’s helped that she’s been able to point to the nearby Texas Tribune as a successful example of what non-profit journalism looks like, but it still requires the slow, sometimes tedious, process of relationship building. While news organizations do need to educate funders, they also need to make the most of the culture in their communities. Tyler is big on gala events, Raja said, so she’s thinking about how she can create a gala-like event that will attract support for the Loop. That meant deeply-reported features and beautiful magazine-style journalism. But Raja realized that she couldn’t pull that off by herself. Raja has worked with a number of local contributors and also plans to lean into her network of national editors to help with the Loop. She’d also like to work with local college journalists to contribute reporting. But while emerging journalists can do some incredible reporting, she has had to recalibrate her expectations for student journalists. With small journalism startups, it’s important to remember to publish within your means and to create coverage that is high-quality but not overly burdensome. Pardon the cliché, but you want to be careful not to bite off more than you can chew. The Loop’s work to further construct a sustainable revenue model is continuing apace. The site wants to grow its network of contributors, produce more reporting, and expand its event offerings. One particular event the Loop is focusing on in the near-term is its Taco Tour, which it first launched in 2017 and has been on hiatus. The Loop sees the tours as a way to introduce its readers to different parts of the Tyler community that they maybe wouldn’t normally visit. The Taco Tour is going to be reborn as a ticketed event — with a limited number of free tickets for members — and Raja is partnering with a local foodie to help lead the program. He speaks fluent Spanish and is working with the local taquerias to produce custom menus for the events. And Raja plans to use the Taco Tour, like all of its events, as a conversation starter to encourage attendees to engage in dialogue about some of the challenges facing Tyler. • If you want to get a sense of how the Loop has grown in the past year or so, check out our story from January 2018 on the original version of the Taco Tour. • Want to engage community funders who don’t typically fund journalism? Here’s how The New Hampshire Union-Leader worked with a local nonprofit. • There are a ton of smart ways to use in-person gatherings to bring communities together. Here are a couple of examples: In Sacramento, Capital Public Radio used “story circles” to discuss the city’s housing crisis. A local digital startup in France is using events to build its membership program. And in Denmark, this local publisher brought together high schoolers and civic leaders for an event it called the Room of Solutions. 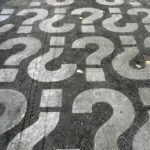 How’s your newsroom thinking about engaging your audiences? What are you doing to generate revenue and move toward sustainability? Let me know! I’d love to feature your work in a future issue of Solution Set.